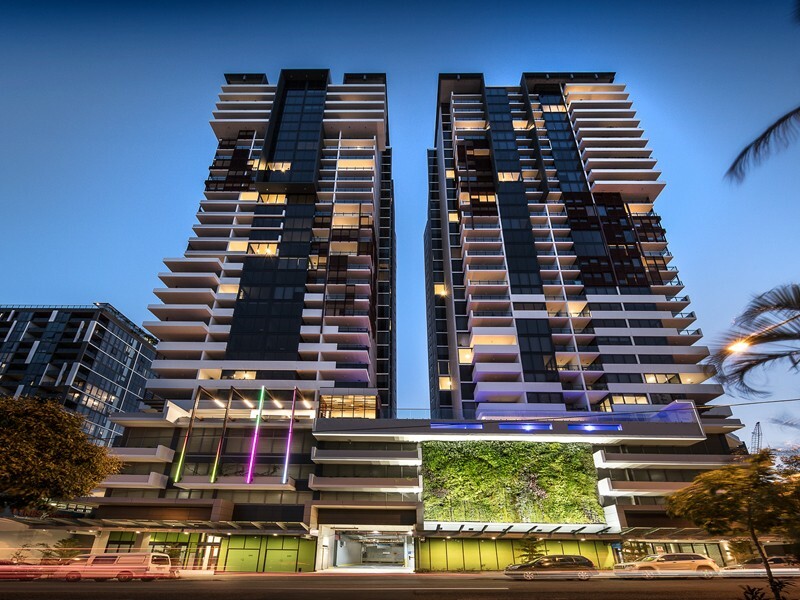 Ivy & Eve is a new residential apartment building located in Merivale Street, South Brisbane. 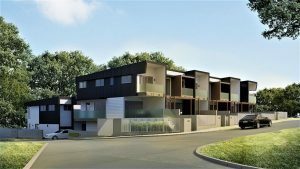 The apartments are suitable for first home buyers looking to get into the property market, as well as downsizers or investors. Completed in early 2018, these apartments are ready to move into today and there’s only a handful left available for sale. 476 apartments across two, 30-storey residential towers with a shared recreational deck. Located on Merivale Street in South Brisbane, walking distance from the Fish Lane and Grey Street Precinct. Prices start from $399,000 fora one bedroom, 599,000 for two bedrooms and $1,035,000 for a three-bedroom apartment. Construction was complete on Ivy & Eve in January 2018. Ivy & Eve South Brisbane exterior. Image supplied by developer. There are a total of 476 apartments across the two towers with a mixture of one, two and three-bedroom configurations available. 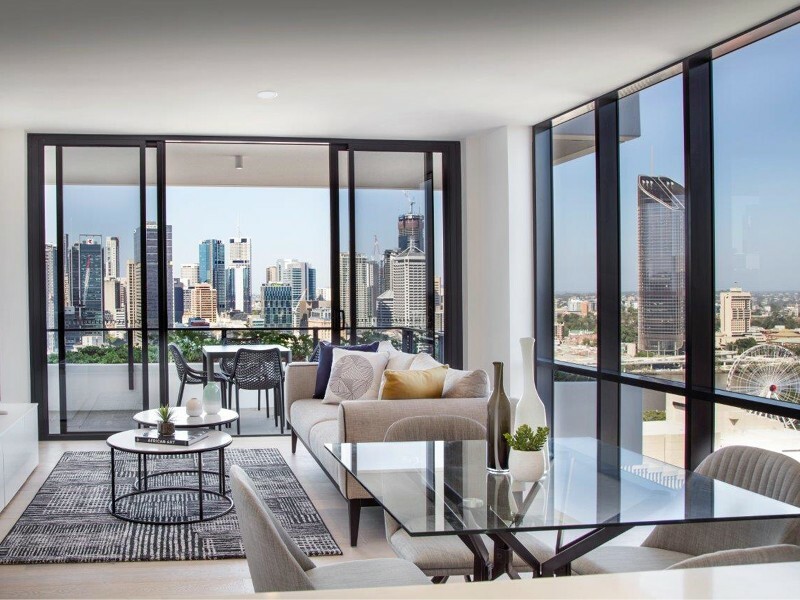 Apartments are orientated to maximise views toward the CBD or Mt Coot-tha, and there will always be something to do nearby. It goes without saying, however, that this is an extremely busy part of Brisbane and residents will be dealing with some traffic noise as part of their day-to-day life — the standard price you pay for inner-city convenience. The resident facilities on Level 5 are the crown jewel of this building, offering a plethora of entertainment options for residents without even leaving the building. 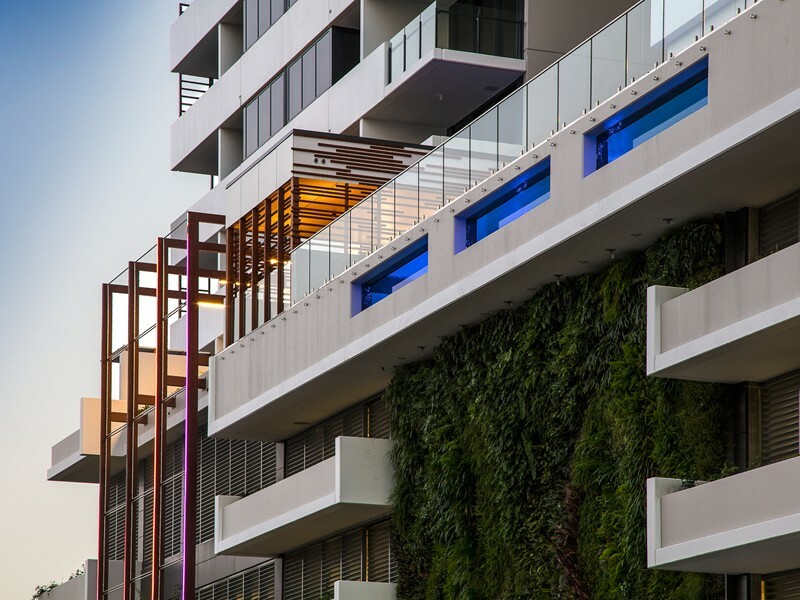 In keeping with the Council’s wishes to keep Southbank feeling lush and green, Ivy & Eve has a green wall integrated on the outside of the podium levels. Ivy & Eve is perfectly located for those who love a morning latte, dumplings for dinner and entertainment-filled evenings — South Brisbane has it all! The onsite management is great for investors looking to lease our their apartment either short or long term. The facilities at Ivy & Eve offer everything you could ask for and residents could easily spend an entire day enjoying the Level 5 amenities. The central location means you’re close to the cultural precinct of South Brisbane as well as Fish Lane. Many of the apartments are quite compact in size and may not be ideal for downsizers who may need more room. 65% of the apartments have been sold to investors. The inner-city location means some low-hum traffic noise may be heard from the Ivy & Eve apartments. 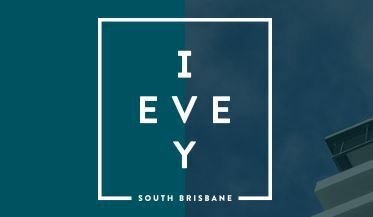 Ivy & Eve is situated on Merivale Street in South Brisbane. Residents have direct access to Brisbane’s major entertainment precincts. Fish Lane is situated right on the doorstep of Ivy & Eve with some of Brisbane’s best restaurants and a growing entertainment hub. Fish Lane is perfect for date night, family dinner, milestone celebrations, can’t-be-bothered-to-cook Monday’s and everything in between. Looking a little further afield, the development sits almost exactly halfway between the Grey Street precinct and the Melbourne Street/Boundary Street dining precinct in West End. The Brisbane Convention Centre, GOMA and QPAC are all within 300m of this development too, so getting your dose of culture won’t be tricky. Just 400m from Ivy & Eve is the Cultural Centre Busway Station and the South Brisbane Train Station. Between these two transport hubs, most of Brisbane is conveniently accessible. For those with little ones, Ivy & Eve is in the catchment area for Brisbane State High School (undoubtedly one of Brisbane’s best public high schools) and close to several other private primary and high schools. Ivy & Eve is in an excellent location for uni students too, with UQ, QUT only 15 minutes away and the Queensland Conservatorium of Music and Queensland College of Arts located right in South Bank. South Brisbane is one of Brisbane’s fastest growing suburbs. Between the 2006 and 2011 Census, the population of South Brisbane increased by 48% to record a total population of 5,420 people. Government predictions show that it will continue to be a high-growth region into the future. The resident facilities on Level 5 are the crown jewel of this project. 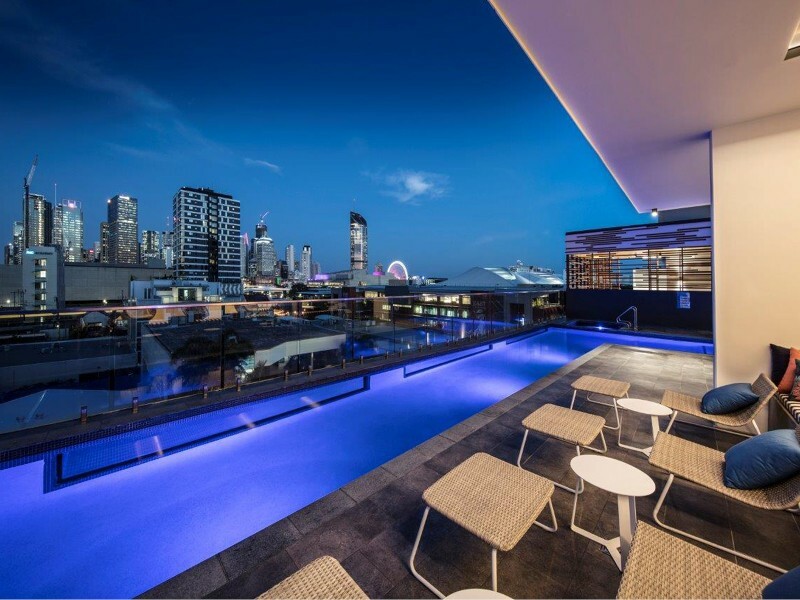 The expansive recreation deck that overlooks the CBD includes an outdoor cinema with tiered seating, Teppanyaki dining area, IT pod, pizza oven, beach house, gym, a games room with a pool table and bar. In addition to this, you’ll also find a glass-edge swimming pool with a spa as well as a sundeck and sun lounges surrounded by lush greenery. The deck has been designed so that each different area feels separate from the rest. It undoubtedly is a very enjoyable recreational area, and large enough for several families to all enjoy BBQs and spending time together around the pool. Parking for this building is located in both the basement and inside the above-ground podium. All apartments have at least one carpark allocated, with some of the three-bedroom apartments having two allocations. There is no option to buy an extra car park at Ivy & Eve. There are 59 dedicated visitor car parks, with 488 residential parking spaces and two spaces for retail car parking. 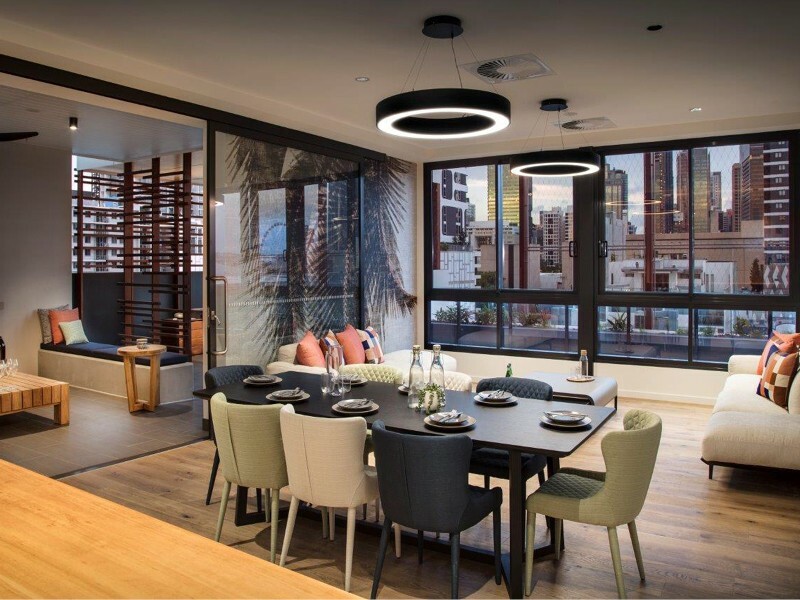 This development offers onsite property management by Song Properties who help to facilitate investors looking to lease out their apartment for short-term and long-term stays. They also attend to maintaining and servicing the building. On the ground floor of the building, there is a cafe which is open to the public as well as residents. This cafe is currently being built and is expected to be open in mid-October 2018. 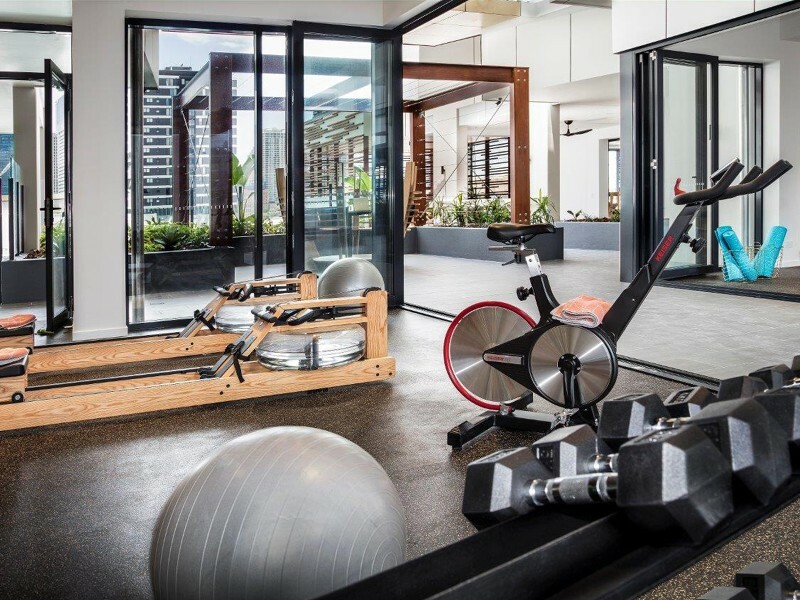 Ivy & Eve South Brisbane gym. Image supplied by developers. The one, two and three-bedroom apartments at Ivy & Eve all have 2.65m ceilings and floor-to-ceiling glass windows in the living area. The interiors are complemented by quality appliances and contemporary fixtures, finely crafted joinery and a colour palette of neutral colours which reflects lights in a lovely way. In terms of air-conditioning, Ivy & Eve apartments have ducted air-conditioning to all living areas and main bedrooms. Ivy & Eve South Brisbane apartment living area. Image supplied by developer. The kitchens in Ivy & Eve have polished, reconstituted stone finishes on the benchtops and the kitchen islands. European appliances, four-burner gas cooktops, stainless steel oven and slide out range hoods finish off the kitchen as well as a semi-integrated dishwasher. The bathroom features statement floor tiles and glossy wall tiles with a small, mirrored cabinet and a wall mounted sink with chrome mixer. Ivy & Eve South Brisbane bedroom. Image supplied by developer. Approximately 70% of all apartments at Ivy & Eve have been sold to investors. The marketing agents have detailed information for investors that include rental appraisals and cash-flow analyse that are available upon request. This complex has onsite management and also hosts a website specifically short-term holiday stay bookings, making the process easy for both investors and for holiday-makers alike. South Brisbane is currently undergoing a massive period of development. There is a large number of new apartment buildings being built and marketed in this area of Brisbane right now. 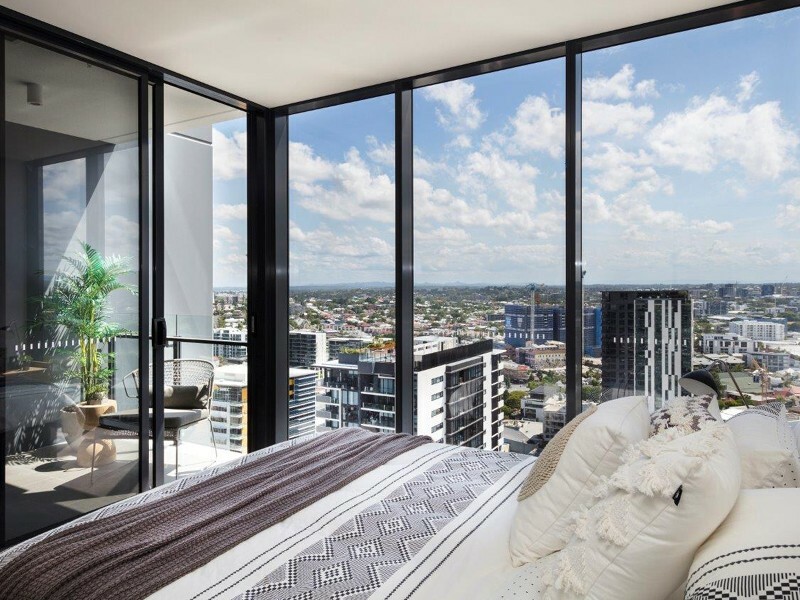 Currently on the market in the area is Brisbane 1 and Skyneedle Apartments. Neighbouring West End is exploding with apartments developments too with INK, Breeze, West Village and Citro just to name a few. Body corporate fees vary for each apartment and are available on request from the sales agents, 360 Property Group. Ivy & Eve is a joint project between Abacus Property Group, local developer KPG Capital and Singapore’s leading property developer CDL. 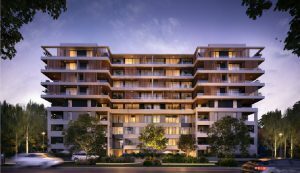 Abacus Property group are one of Australia’s largest diversified property groups with a long list of successful projects since their establishment in 1996. 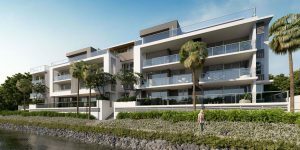 The developers worked alongside top-tier Australian building company Hutchinson’s Builders to bring this project to life. Ivy & Eve has a number of display suites on site which are available for inspection by appointment only and can be arranged by 360 Property Group. 0409 186 845Click to display phone number.